The Foxtrot originated in the summer of 1914 by Vaudeville actor Harry Fox. Born Arthur Carringford in Pomona, California, in 1882, he adopted the stage name of "Fox" after his grandfather. Harry was thrown on his own resources at the age of fifteen. He joined a circus for a brief tour and he also played professional baseball for a short while. A music publisher liked his voice and hired him to sing songs from the boxes of vaudeville theaters in San Francisco. In 1904 he appeared in a Belvedere Theatre in a comedy entitled "Mr. Frisky of Frisco." After the San Francisco earthquake and the fire of 1906, Harry Fox migrated East and finally stopped in New York. In early 1914, Fox was appearing in various vaudeville shows in the New York area. In April he teamed up with Yansci Dolly of the famous Dolly Sisters in an act of Hammerstein's. At the same time, the New York Theatre, one of the largest in the World, was being converted into a movie house. As an extra attraction, the theater's management decided to try vaudeville acts between the shows. They selected Harry Fox and his company of "American Beauties" to put on a dancing act. An article in Variety Magazine stated "Harry Fox will appear for a month or longer at a large salary with billing that will occupy the front of the theatre in electrics". At the same time, the roof of the theatre was converted to a Jardin de Danse, and the Dolly sisters were featured in a nightly revue. The May 29, 1914 issue of Variety Magazine reported "The debut of Harry Fox as a lone star and act amidst the films of the daily change at the New York Theatre started off with every mark of success. The Dolly Sisters are dancing nightly on the New York Roof. Gold cups will be given away next week to the winners of dance contests on the New York Roof." The Fox-trot originated in the Jardin de Danse on the roof of the New York Theatre. As part of his act downstairs, Harry Fox was doing trotting steps to ragtime music, and people referred to his dance as "Fox's Trot." In the rise to fame of the Vernon Castles, exhibition dancers of outstanding talent and charm, there was no doubt that the fox-trot was the most original and exciting of their various dances. The elite of the dancing world were soon trying to capture the unusual style of movement and when a very talented American, G.K. Anderson came over to London, and with Josephine Bradley won many competitions, he set the seal - so to speak - on the style of the foxtrot. As a result of the great popularity which ballroom dancing was enjoying, it was necessary to evolve a form of dance that could express the slow syncopated 4/4 rhythm and yet could remain "on the spot." This did not mean that the "traveling" fox-trot was dropped, but the "on the spot" dance did provide a means of enjoying the music in a background which large numbers of people could afford and enjoy, and where various bands were all producing excellent and individual musicians and experimenting with and perfect all of the new sounds and beats from America. The "on the spot" dancing was known appropriately as crush, then rhythm dancing. It is now called "social" dancing and possibly this conveys its purpose and limitations. It would be anti-social to attempt to stride around a ballroom crowded with dancers, to dance with only one partner when out with a party, or to be so engrossed with the performance of figures that any conversation is taboo. It can also create a very good base - should it be desired - for the foxtrot. The Foxtrot was the most significant development in all of ballroom dancing. The combination of quick and slow steps permits more flexibility and gives much greater dancing pleasure than the one-step and two-step which it has replaced. There is more variety in the fox-trot than in any other dance, and in some ways it is the hardest dance to learn! 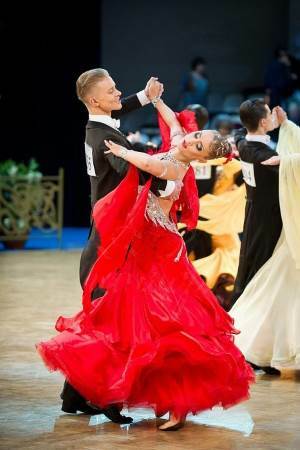 Variations of the foxtrot include the Peabody, the Quickstep and Roseland foxtrot. Even dances such as the lindy and the hustle are derived to some extent from the foxtrot. Foxtrot Syllabus and Foxtrot Steps.